Humza Yousaf revealed the figures in a letter to Labour justice spokesman Daniel Johnson. They showed 12% of Scotland's single cells have had more than one prisoner. The Scottish Prison Service said prisoners had been in doubled-up cells - particularly at HMP Barlinnie in Glasgow - for decades. Mr Yousaf confirmed that, as of Monday 21 January, there were 5,877 single cells occupied within the prison estate, 710 of which were doubled up. Mr Johnson said: "Scotland's prisons are bursting at the seams as authorities struggle to cope amid a lack of resources from the SNP government. "We shouldn't have Victorian-era prisons with overcrowded cells in 2019, it is simply not acceptable." He called on Mr Yousaf to "come to Parliament and outline what he will do to end this scandal in our prisons". "Labour knows that you cannot keep our communities and prisons safe on the cheap and that's why in government we will invest in our public services to end the scandal of doubled-up cells," Mr Johnson said. 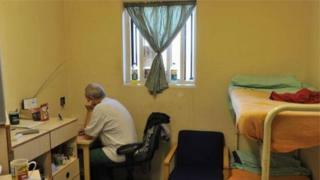 A spokesman for Mr Yousaf said the Scottish government was focused on reducing prisoner numbers. He said: "Scotland has the highest rate of incarceration per 100,000 of population of any western European country which is why we are focused on action to stop people going to prison in the first place. "Our approach to reducing reoffending has seen reoffending rates drop to a 19-year low, and we are committed this year to extending the presumption against short prison sentences in favour of more effective community penalties. "If we had followed Labour's budget proposals - this would have resulted in a 3% cut to the prison and community justice budgets." A Scottish Prison Service spokesman said doubling-up was not a new situation. He said: "For at least 20 years prisons have been doubled-up in single cells. "Our aspiration is for one prisoner to one cell, except for in circumstances where it would be better for prisoners to share. "Prison numbers are what they are, and while we want to get to the stage where each prisoner can have their own cell, yes, many prisoners currently are in doubled-up cells. "But the reality is that we've had unprecedented investment. "There has been bigger investment in the last 12-15 years than we have had in our history, allowing us to move away from Victorian-style prison conditions to modern, fit-for-purpose facilities." He added that the Scottish Prison Service's long-term aim was to build a new prison in the Glasgow area. Figures released last month showed that in December nine of Scotland's 15 prisons were at or above capacity, with HMP Barlinnie operating at 139% capacity and HMP Inverness at 137%.